WHAT SHOULD I DO IF I SEE RED? bladder cancer. Don’t ignore this warning sign. Not even once. It does not necessarily mean you have bladder cancer. 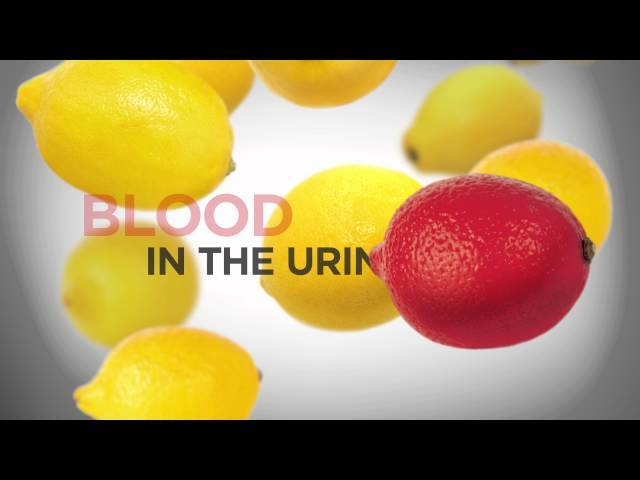 Several conditions can cause blood in your urine (called hematuria). But it’s important to be checked by your doctor as soon as possible to seek treatment for what’s causing the blood in the urine and to rule out bladder cancer as the cause. Just because there is no pain, your condition may still be serious. Although the condition may be a bladder infection or urinary tract infection (UTI), be sure to ask your physician to do some tests to confirm that it is just an infection. If there is any doubt, ask for a referral to a urologist to investigate. Early detection of bladder cancer is critical to receiving timely and effective treatment. It may save your life! IF YOU SEE RED, SEE YOUR DOCTOR IMMEDIATELY. WHAT HAPPENS ONCE I SEE A UROLOGIST? To see if you may have bladder cancer, the urologist will do a cystoscopy. A small camera on a thin tube is inserted into your bladder through your urethra. You’re awake for this test, but the urethra is numbed with gel. It’s a fairly quick exam and is essential. The urologist will also check your urine for abnormal cells and may order both an ultrasound and a CT scan. Bladder cancer is the 5th most common cancer in Canada with close to 9,000 new cases every year. It ranks number 4 in men and number 12 in women. Caught early, the prognosis is excellent for most people. Caught late, it can be a life-altering or life-ending disease. Once diagnosed, lifetime urology checkups will be required. Don’t ignore the symptoms. Your bladder may depend upon it. Your life may depend upon it!